The wonderful work that has been done in rescuing children who have neither sight nor hearing from the mental and moral darkness that encompassed them. A few years ago a memorable address was delivered in the State House whose gilded dome overlooks Boston Common. It was the strangest address, in some respects, to which any body of legislators had ever listened. 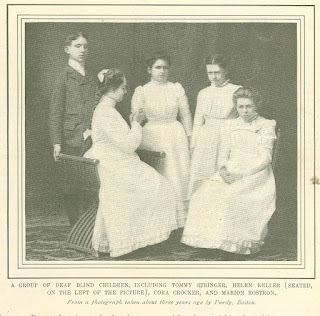 It was an appeal for a stricken class of humanity, delivered by a young girl who herself belonged to that class - Helen Keller, blind and deaf from infancy, and taught to express her thoughts as if by a modern miracle. The incident, which will never be forgotten by those who witnessed it, marked a new era in the history of the deaf blind. Public attention was called to them as never before by the wonderful exhibition of mental development given by one of their number. It was known that here and there others were being educated, but few realized how numerous are these human derelicts, or understood the beneficence of the work that rescues them from an isolation worse than death. That this can be done has already been proved in several cases, among which that of Helen Keller has attracted the greatest degree of attention. The sympathetic interest of a whole nation was aroused when it was announced that this young Southern girl, so terribly handicapped by nature, was about to submit herself for entrance to the coeducational annex of Harvard University. She asked for no relaxation of the college require¬ments, but went to Cambridge to take the regular examination. Of course, she could not see the examination papers or hear the examiner's voice. The easiest method of communicating the questions to her would have been to invoke the aid of Miss Sullivan, for sixteen years her instructor and close companion. Miss Sullivan does not know Latin, Greek, or the higher mathematics, and could have spelled out the questions to Helen without any possibility of helping her to answer them; but it was thought best to avoid any possible appearance of suggestion or assistance. Recourse was had to an instructor of deaf mutes, Mr. Vining, who took the papers as fast as they were given out and copied them in Braille characters, the system of writing in punctured points now generally taught to the blind. He had never met Helen before, and could not converse with her orally, as Miss SulIivan can. 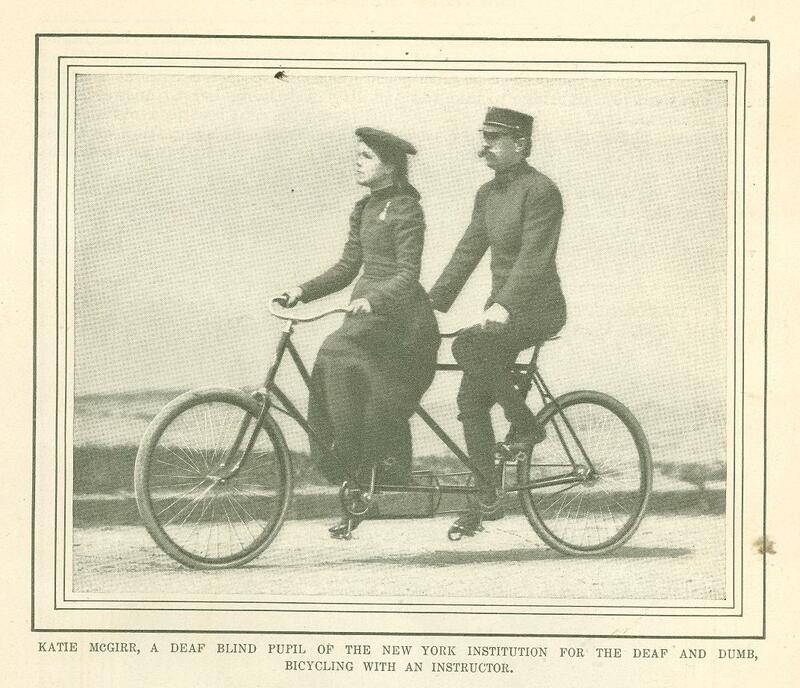 Moreover, and most unfortunately, it was found at the last moment that Mr. Vining's system of Braille was slightly different from hers, he using the American style, and she the English, in which most of the Braille books are printed. However, there was nothing to do but to go ahead with the examination, leaving her to puzzle out the unfamiliar method of writing. She took the questions as they were transcribed, in the presence of a college official who could not communicate with her, and wrote out her answers upon a typewriter. 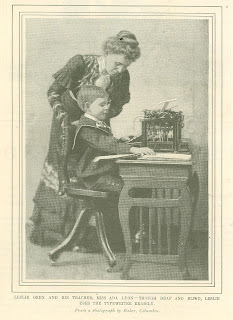 To add to the deaf blind girl's difficulties, the specially-made watch upon which she relies for her knowledge of the time had been left behind, and she had to work without being able to know how many hours or minutes remained to her as she went from question to question -a serious disadvantage, as every student knows. But she passed the examination credibly, not to say triumphantly. Her answers were satisfactory in every subject she took up; in Latin she earned a high mark, and in Greek a very high one. It was indeed a marvelous performance. 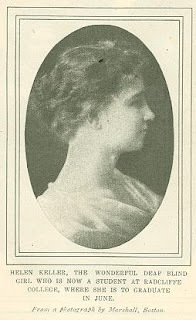 That is one side of the picture; the other is the black and hopeless prison that would have been Helen Keller's abiding-place but for the teaching that has made her a happy and intelligent college girl. There could hardly be anything sadder than the existence to which the untaught child who lacks sight and hearing is perforce condemned. Surely nothing could appeal more pathetically to the benevolent and the tender-hearted than the sight of a boy or girl whose mind has never been awakened, whose soul lies dormant in utter darkness, whose life is little better than that of a vegetable. "Even to the casual observer, she had two attractive features - her mouth and her hands. At times a smile of marvelous sweetness played about her mouth, illuminating her features with an intelligence that was beautiful. To Linnie's hands, however, had been given a most appealing beauty. Slender, tapering fingers, unsoiled by contact with the rougher elements of life, are always objects of admiration; but when endowed with intelligence - a clinging, speaking soul - they are irresistible. Such were Linnie's hands; their pleadings could not be resisted, and they won the way to my heart. Exquisite hands and a beautiful smile were her credentials; and she expected humanity to accept, with them, fourteen years of undisciplined life, absolute ignorance, passions uncontrolled, infant helplessness, and all the faults and weaknesses of such a condition." For two years :Miss Donald gave this almost mindless creature her undivided attention. Naturally enough, Linnie's mental awakening was slow. She began by learning that each of the objects around her had a name; but her teacher's chief task, at first, was to gain her confidence and affection, and correct the alternately violent and indolent disposition that had developed during the child's years of darkness and ignorance. But once fairly started, her advance was astonishingly rapid. At eighteen, she began systematic study. Her special gift seemed to be for mechanics. Her fingers passing over a typewriter or a sewing machine told her all about its mechanism. She can use not only the special typewriter constructed for the sightless, which. makes the Braille characters, but also the ordinary commercial machine. She can write a good hand with a pencil, and takes much pride in her original compositions. In reading, she can use several different systems, having mastered all those in common use among the blind. 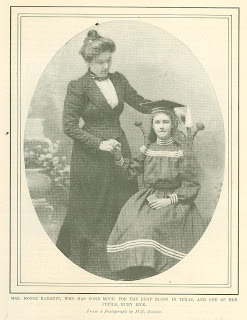 Today, seven years after her first instruction from Miss Donald, Linnie Haguewood is an assistant to her teacher at the South Dakota School for the Blind. Some of the pupils now under her care are children who possess the gifts of speech and hearing. The name of Tommy Stringer has often been mentioned with that of Helen Keller. Tommy, who is now in his eighteenth year, is a very interesting and remarkable boy, and touching feature of his story is the fact that he owes his rescue from a life of darkness to the sympathy of the blind deaf girl. Like her, he lost sight and hearing through illness in infancy; and at five years old he was an inmate of a hospital in Allegheny, Pennsylvania, absolutely untaught, too weak to walk, and seemingly both helpless and hopeless -" a mere lump of breathing clay," as one of his first teachers afterwards called him. During a visit to Allegheny, Helen Keller chanced to hear of him. She interested others, and money was raised to send the poor boy to the Perkins Institute, in Boston. It took nearly a year to teach him his first word, which was bread." Every time a slice of bread was given him, his instructor spelled the word with his fingers in the boy's hand, and made Tommy's fingers spell it in the teacher's hand. Then other objects - a ball, a book, and the like - were presented to him, and their names were spelled in the same way. Days would be spent over a single word before Tommy could spell it himself; but finally he understood the nature of a noun, and passed on to simple sentences. At seven he was beginning to read raised letters, and from that point, as with others of his class, his progress was rapid. He took up grammar, history, mathematics, and physiology. From the Perkins Institute he went to a public school, a teacher going with him to act as interpreter. "There is not a more industrious or a happier boy in the school than Tom," said a newspaper man who went to see the lad at work. "If you think his affliction has made him downhearted or morose, you are greatly mistaken. He is as merry a boy as I know of, and he gets more out of life than most young people of his age." There are other interesting cases like those of Helen Keller, Linnie Haguewood, and Tommy Stringer; but these three are sufficient examples of the good work that can be done in rescuing the deaf blind from a life of utter darkness. Originally published in Munsey's Magazine. February 1904.